I started to draft this on ANZAC Day, but never got around to finishing it…. This year I went to Little D’s school and did the ANZAC Day address. It was great to have the opportunity, I wrote my address about what ANZAC Day means to me and how it is important to my family. Frustratingly I got my times mixed up so arrived late and therefore flustered. I was so angry with myself I was cursing the whole the drive there. But it went ok. I got some lovely feedback from some of the other parents, which made me feel better. These are my Great-Grandfathers medals with my own. I am so proud of his and although I am very proud of my own, I didn’t have to experience horrors or suffer a poofteenth of what he did to get them. I will never forget that. I don’t normally wear uniform for ANZAZC Day. My Great-Grandfather was awarded the Military Medal in France in 1916, and when I wear my uniform we are not permitted to wear medals other than your own (there are lots of rules around uniform, this is just one of them). So generally I prefer getting to wear civvies, so I can wear his medals, with mine, with pride. People still look surprised when they see me with them, I am sure it is just because I am female? Or maybe it is being female and that I have Little D and Little L in tow with me? I’m not sure. For the school address I polished up my Same Browne belt, got the uniform looking good and could wear it without fear of looking ridiculous. Nothing was too tight and in fact – my pants were a little too big. Which is awesome, I am the same or smaller than when I joined up. Little D got to wear her Great-great-Grandfathers medals – she was so careful of them it was lovely to see. ANZAC Day is really special for me. To me it is more significant than Australia Day and something I think we, as a nation (not to mention the Kiwis), can be really proud of. My family has history with the military, obviously my Great Grandfather, my Dad is a Vietnam Veteran, then Big D and I are both currently serving. I am very protective of the day and get frustrated with the media coverage. I think aligning football players with those who have gone of to war is insulting to the ANZAC’s memory and sacrifice, being mates on a footy field and making a tackle to protect the ball, doesn’t equate to putting yourself in front of a Turkish machine gun. But that is just me. In the past couple of years I have had a few people say ‘Happy ANZAC Day’? To which I respond with ‘WTF’?? Holy crap, where has that come from? It downplays the significance of the day. Sure people don’t go to work, but it isn’t a public ‘holiday’, it is a day of remembrance, commemoration and recognition of sacrifice. Lets not forget what the day is for. As those who started the tradition have passed on, those of us who remain have an obligation to keep the day true to its intention. To me that is paying your respects to the sacrifice and service of all those who serve, but mostly those who have served and not returned or returned not themselves. As time passes on those numbers are becoming greater and I imagine will continue to do so for some time to come. As I child I attended many a Dawn Service and I see it as a right of passage for all Australian children. As my career has continued it has become a more personal affair with some of my own friends lost on Service. A number of them have been killed through tragic error or oversight by other nations militaries and it breaks my heart that those responsible for their deaths will never be held accountable. But that is probably a blog for another time. Catching up after the end of Round 1 plus a few weeks! I attended my first yoga class and now attend hot yoga at least once a week and take Little D along to a kids class on Wednesday (who would have thought it would be on offer in Regional Victoria?). I have been attending the lunchtime circuits at work and been smashing them. This week we did a circuit that included box jumps on the old gym box horse things (I remember something similar from school) – so it was about waist height – and I did them, I had been keen to try them but hadn’t had the opportunity. Loved it, such a good feeling to do it and not just once, but repeatedly for the time period on the exercise. Awesome. I am wearing size 12. My best buddy who came to the Finale Workout with me (who joined the Army with me so we have known each other for 20 years) thinks I am looking the best she has ever seen me. Now that means I am doing something right. So the scales aren’t telling me I achieved my goal, but I am content with the achievements. I still have lots of work to do on my food – but that is nothing new. Waiting for the workout to begin. The finale! It seems like a lifetime ago already – although I enjoyed the workout, I haven’t signed up for the next round. I plan to keep doing what I have been doing, keep the workouts going at work, see my PT on Fridays, fit in a run (hopefully on the weekend or at work) and do yoga one night a week. But of course the biggest thing is to work on my relationship with food. I am conscious of it, just chose to give in too easily, pretty much daring myself to eat stuff. Crazy what I do. Last week Big D was away and I actually found myself binge eating – I don’t recall having eaten like it before. It shocked me. As much as I like the 12WBT and I know I will miss the online workouts and in particular (especially coming up to Winter if I need to do the early morning training). Not having the forums to go to for support will also be a loss. But I think I am a little stale, and would like a little freedom to make my own path without feeling I am wasting money. I won’t say no to future rounds. I am attracted to the Lean and Strong program (which is lots of weight training to really define the body) but that is something for when I have more time to get to a gym or have a place at home to set up some weights. At the workout I bought a FitBit – it is a pedometer on steroids, once I work out how to copy my dashboard to show what it does, I will talk about it some more….. I have been noticeably absent from my blog. Not that I haven’t wanted to be on here, I still have lots to say, but just haven’t managed to spend the time to make it readable. I have the opportunity today because I am not pushed to take Little L out or do any domestic chores. I had some surgery yesterday to remove a couple of moles and a cyst. After having a melanoma removed last year, I am not shy in taking anything off my skin that may be slightly suspicious. Fortunately I am not too sore, but have to keep ducking Little L and his busy hands! I do feel a little like Frankenstein with stitches on my left temple and a bandage on my neck which means I don’t have full movement. But that will all be gone when I go back to get the stitches removed on Tue. I will work to catch up on my posts in the coming days. I hope all those who are into Round 2 12WBT have started well….. Muscle Mass – 52.3kg (49.6kg) HURRAY! As much as the weigh in is depressing, I am really pleased with the increase in muscle and decrease in fat. That really is what I need to aim for, I am just not sure really how fast it moves and therefore what goals to set. Any suggestions? I have been looking a little at Metabolic Conditioning – at first glance boils down to keeping protein in every meal, certain supplements (omega 3?) and eating during certain windows. As much as it interests me, I think I will keep going it alone for the next little while, just to see if I can continue to improve the important numbers highlighted above. Perhaps I am programmed out having down two rounds of 12WBT back to back. I am feeling under the pump today – short of time to do everything before flying out to Melbourne this afternoon. The kicker is that I can’t find the transmitter for my HRM! Argh! I made sure I washed the strap and now I have misplaced it wherever I took it off. So FRUSTRATING! I need to pack it to see how much I get smashed at the Group Workout tomorrow! Any psychics out there that can see it – get in touch quick! How time has flown, it is now week 12 of the 12WBT. I can’t believe how this round seems to have passed so quickly. So I have three days to achieve my weightloss goals!! Ha, not likely. The time passing of course makes me think of the wasted opportunity – I could have done better through every one of the 12 weeks – but it is not worth wasting my brain on chastising myself for it now. The past three weeks I aimed to lose 2kg after having a terrible weigh in and struggling to get back on track. I started strong and I still might make it, perhaps not tomorrow morning but perhaps by Fri. I am weighing myself every couple of days and I am always astounded by the variations. 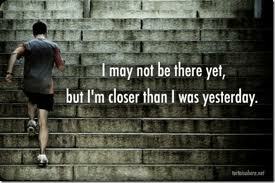 As an example, I was well on track last Wed to achieve the 2 in 3 weeks – but this morning it seemed to be all back again! I have continued to get to the lunchtime circuits at work which have been great. Today was a specific circuit for a new fitness test we have to do and it was hard work. Over 420 cal in 40 mins, I think that is pretty impressive. It was tough, but it is only a taste, when you take on the read PT to get you to the test, you are carrying something like 20kg including a pretend rifle. Ouch. The good news is a managed to get to hot yoga as well tonight. I put on my HR monitor to see what sort of calorie use I got out of the session – another 200 down. What I am really looking forward to is the 12WBT workout with Michelle Bridges and probably 1200 other people on Sat morning. I am meeting an old friend I joined the Army with in Melbourne and we are hitting it together. It will be just like old times. She is such a great sounding board for me and I will certainly be taking the opportunity to talk about what I will be doing next with myself. I am labouring over the decision to get out of uniform and even though I had a sense of having made a decision to do it last night (and woke this morning feeling lighter as a result), some good vibes at work today make me question myself again. So she will help me to see straight and provide perspective it can be hard to find when you are still wearing green. We aren’t going to the party – it isn’t really our thing and to be honest, having a nice dinner will be more than enough excitement for me! I have plans for shopping for this mostly size 12 body that I have now (down from a 16) and I don’t think I would have time to make myself ‘cocktail’ party ready in the same day (including finding a frock)! I don’t think I will be signing up to round 2 of 12WBT. As much as I am tempted with some of the new improvements and additions to the program, I don’t think I have the drive to make the most of the money that I would be spending. So I will go it alone, being satisfied with the steady yet slow progress I have been making this round and try to come up with revised goals. I have been on the hunt for new fitness goals and still keeping an eye out for more diversity in my training. But I will let you know about that. My work this week has paid off, I have lost 1.2kg since the last weight in. Phew, a sigh of relief. So that means I lost all the weight I had put on last week plus a little more. That really makes me pleased. then back to the start! It was so good, I just loved it. The cool thing was passing four men in the process. Since we started one after the other it was easy to see your progress. Now, although I did pas four blokes I will admit they are all probably older than me, so I probably should have passed more of them! I popped into the cardio room and managed another 15 mins on the cross trainer and bike to get me up to 500 cal. In terms of Tightened Tuesday theme, I didn’t blitz it, but I certainly did better than last week. I guess that is why the scales were so kind to me. I do like the idea of having a ‘clean-ish’ day once a week. Last night while the kids had scrambled eggs and tuna bake (enticing isn’t it? Little L is so tired after a day in care, I cranked out the eggs to get him eating while the tuna bake cooked) I just got some salmon from the freezer and had that with a bag of steamed veges. Sure they may not be fresh from the fridge all cut up with love and care by me, but it was quick and really tasty and I am sure would be ok for desperate 12WBT meal. If you haven’t tried this salmon it is really yum and not too big to overtake your meal calories. 6 burpees, 8 upright row-press, 12 dead lift, 10 frog sit-ups, 14 pushups, 16 supermans (each side then arms and legs = 1), 20 step ups with medicine ball above the head, shuttle run. Once that was done, you then started to go back down dropping off exercises. So it was pretty intense. By the time I got a few extra stretches in there was 450 cal gone. I had to drive to the circuit but managed to fit it in with a shower before a meeting, very handy! This afternoon I grabbed Little D and we went did kids yoga together. It was really lovely, it is nice to have the chance to do something with her rather than watch her (like most kids activities). I hope we will make it again next week. It just means a quick dinner when we don’t get to pick up Little L until after 5.15pm (I know that is early for many people who have a long way to drive or heavy traffic)! So a not so 12WBT friendly dinner of toasties. But not too much, they were popular so the kids kept stealing mine! I hope your week is going as well as mine. Although, I wasn’t so happy this morning. Little L having a tantrum getting into the car and gave me a fat lip! Charming….. I wrote this on Monday – just didn’t manage to post it. I was really pleased with yesterday morning, I got up and went for a run that actually wasn’t too bad! It certainly started hard, but once I was warm I actually enjoyed it. It has been such a long time since I have made the effort to get out like that. 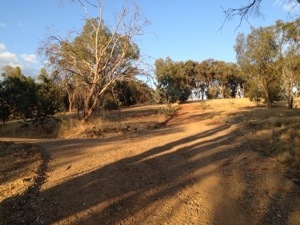 This is where I did my hill run, it goes around to right (where you can’t see) so makes for a good round up and down. I planned to try to make up for Saturday and work on reaching 1000cal. So I headed out from home with a plan in my head to run the 8km track I did a while ago. Once I got to the point where my brain was saying ‘home isn’t too far now’ I looked at my watch and realised that I had hardly broken 300 cal! What the…? So I headed to the hill in the photo and did a few hill runs. They went better than I expected too. Now I have to explain my HR monitor situation. I got an awesome Garmin for Christmas but when I use the HR monitor with it, the cal count is SIGNIFICANTLY different to my trusty old Polar (I got it around 2006 and it is still going) – I am talking 100s of cal less. So I have been wearing the Garmin on my wrist for distance measurement and the Polar HR monitor (with the watch tucked away) for HR tracking. Today I realised that the Polar HR monitor was transmitting to the Garmin. By the end of the run, including hill running (in an attempt to get the cal up) I still only used 680 cal! I did use Mapymyrun too and it had me over 800 cal, so that makes me feel better! I am a little confused by the Garmin formula that calculates cal use, there is so much difference between Polar and Garmin that I wonder what is the closest? Maybe they are both out and might be the reason I find it so hard to reach 1000cal? That is more likely to be wishful thinking! Unfortunately Little L woke this morning still with too much snot coming from his nose and coughing, so I have kept him home. I had planned to go to work and actually was looking forward to it. Besides having planned to attend the lunchtime circuit, it would give me a chance to tidy up after last weeks meetings. Possibly the little guy may have been ok at childcare, but I am sure I would have got the call to come get him. To be honest, if another parent sent their child to daycare in the state he was, I wouldn’t be happy. Plus he only sleeps once at daycare, twice at home. So I find he gets unmanageable with tiredness. Hopefully the extra sleep will mean he will be well enough to go tomorrow. Then I can get to the lunchtime circuit where I won’t have to drive anywhere. I will put him into bed soon, so I will try to squish in a 12WBT workout videos (which I did! Earn Your Burn with a bit of Burning Bridges to get my cal to 500). Sleep and food my two biggest issues – STILL. Anyone else still fighting those demons nine weeks into Round 1? I took Little D to see the local production of ‘The Sound of Music’ yesterday. Although it felt like it went for a LONG time (mostly because she found it hard to sit still in a tulle dress that wasn’t the best choice and the lady in front was getting annoyed at her) Little D really loved the ‘movie’. She found it hard to get her head around the stage thing – ‘I can’t see the screen’. This was one of my Mum’s favourite movies so we always watched it when it was on the TV. You know, a Sat or Sun daytime movie. Mum would be ironing and we’d be floating around watching it with her. In turn, it is one of my favourite classics. One of the things that impressed me is that all of the people in the cast, in the orchestra, doing the sets, lights, costumes etc, etc probably did it on their own time. I can’t imagine the man hours that went into its production, they should be very proud. It was great to see a full house at the Albury Entertainment Centre, people getting behind the efforts of the local theatre group. I am so flat out with my life and thinking I am busy I don’t have any hobbies or interests outside of work, kids, exercise and the home! I am sure this isn’t unusual, but I really admire those who contribute so much to the community, either volunteering with sport, charity or wherever. I keep wanting to do more, but find making the commitment just a little tricky. I tell myself I am busy, but really – am I? Possibly not on the scale of some people, but I still find myself running around like a crazy person. Perhaps just to unorganised – perhaps a discussion for another post. I did manage to get in my SSS Saturday morning before everyone else crawled out of bed. As usual, having followed the workout program, I was 600 cal short of the 1000 cal goal. That was frustrating, then I ran out of time to do it all again or go for a run to top off the workout. So I just took what I managed and left it at that. My Friday session with Scottie wasn’t one of my best. He got me to start on the rower to knock out 1000m in under 4min (I think). Which I managed with slightly jelly legs at the end. He then put me on the bike to complete 4 km keeping the rpm at 100kw (is that the right measure?). This was awful and for the first time found myself unable to meet what he asked me to do. Now, I am always ready to tell him he has to be kidding when he explains what we are doing, but I just put my head down and get on with it. But on the bike, I could have just stopped and asked for burpees instead (now THAT is saying something!). He took pity on how long I was taking, stopped at 4mins rather than 4km and took me out to do some weights. Of course there were burpees interspersed with ab and arm exercises. We then finished with the heave beam, doing leg raises and finally heaves. Funny, I had been thinking of heaves as a fitness goal, but hadn’t verbalised it, now I think we will be finishing with them all the time – awesome (not sure if that is heartfelt or sarcasm). I may need to adjust my program with either five or six days training, but having my rest days during the week. I am still finding it hard to get to bed early enough to get out of bed before the kids are awake. When Big D is home late, I feel a bit rude going to bed as he gets in the door. I am finding myself so knackered by mid week it is easy to not get up to workout pre-dawn. As an indication of how little attention I am paying, by the end of the week I don’t even remember what workouts I have done! So I have a new stick on weekly calendar for my fridge to help me plan and then take note, very cool. Will show you soon. Here is to three weeks until the end of the 12WBT Round 1, a nutty workout with Michelle and catching up with my best friend. I am working on 2kg in 3 weeks. Wish me luck!